For a majority of the 20th century, fashion observers could gauge the state of the economy through women’s hemlines: When the Dow was up (think 20’s and ‘60’s), shorter skirts were in. A consistent downturn led to longer hemlines—and so it was in the 30’s and ‘70s. Today, we need only look to grad school applications to gauge the level of economic malaise. With fewer employers on campus, many students in the class of 2009 are quietly re-evaluating their chances for employment success while taking steps to prepare for Plan B: More education. As of October, one Manhattan based testing preparation company reported that class enrollment was already up over 50% over 2007. Requests for FAFSA applications for financial aid are up 9%. How much is pursuing a graduate degree going to add to my burgeoning undergraduate debt? Note: Now’s a good time to sharpen those cost/benefit analysis skills. Do I really want or need to study this subject at a higher level, or am I just looking for an excuse to wait out the poor economy and please my parents? Will I be more marketable with this particular graduate degree than with an undergraduate degree and a couple of years’ relevant experience? 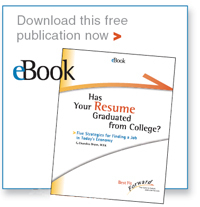 Sheila points out that recruiters have mechanisms to hire those coming straight out of college, and an employment division to hire those with experience, but often have no formal avenues to hire the person with a graduate degree and no experience. And, it turns out that employers have some strong opinions on the subject of further education. I agree with Sheila’s conclusions. And I think it’s about time we started to talk about the elephant in the room—especially since it’s going to be increasingly difficult to get financial aid from cash-strapped universities. Campus may not be safe haven from the economic storm that many students and their parents suppose. Maybe it’s a smarter decision to work for McDonalds after all. I am not saying that you should “settle” for flipping burgers after earning a college degree, but I do think that a job can set you up for career advancement. I, too, graduated from college during a recession and I recall talking to a friend of a friend who took the only job he could find—delivering pizza for Pizza Hut. Matt was a business major and fluent in German. After eight months, he was managing the store. Within two years, Matt worked in Operations for Pizza Hut in Germany and was on a fast-track for senior leadership positions within the company. Sometimes it isn’t a matter of where you start, it is how you take advantage of the opportunity you have that counts. The end result of any given job search will likely be a positive one in the long-term. This week I attended a two-day conference on the future of the recruiting industry, a mini-conference on Branding for Sustainability. and capped it off by time at the registration for desk for an International career fair and a conversation with a Communications Director of a Healthcare system. In short, I feel like I've taken a condensed crash course in the current state of the economy. There are fewer silver linings in this economy than I would like to report. In fact, there aren't even any copper linings--in Philadelphia, many homeowners are reporting thefts of copper drainage pipes--the metal can be recycled and is quite valuable in a melted down form). From positions in the recruiting industry to hospital bed admissions, numbers appear to be down across the board. (Educate yourself about the area in which you want to be known, and get advice from others who work in the space). David's a rock star and his approach to his career is--in my opinion--spot-on. It doesn't matter if restaurant numbers and consumer spending is down...he's positioning himself to be found by an employer who will value and appreciate his expertise. I couldn't have said it better myself. So, meet David. Then share your story--and own tips to be known here!